Installation of Composer on Windows(XP, 7, 8) is easy, its only take few steps. What is Composer? it is a dependency manager tracking local dependencies of your projects and libraries. get it here. It allows you to declare the dependent libraries your project needs and it will install them in your project for you. I assume you have xampp installed, you can get latest version from here. Step 1) First step is to make you enable run PHP commands on Command prompt. so let the CMD(Command prompt) know where is your php.exe exist. In my case I have xampp installed in D:/ drive. so it is D:\xampp\php. copy this path. 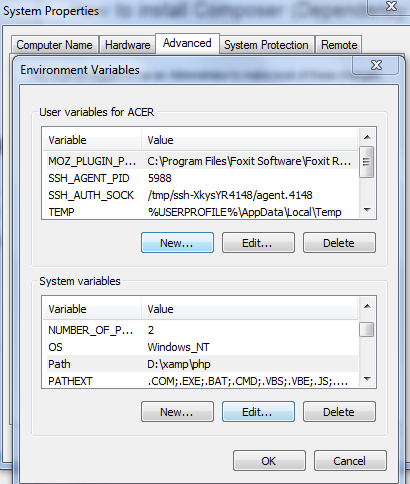 Next right click on My Computer, then click on Advanced System Settings, under Advance tab you will see Environment variables button. click on that a dialog box will pop up like bellow. Edit path variable and set it to D:\xampp\php. make sure you put this at the end of path string. its actually already have few paths, which are necessary to run other commands in windows. Now check it works? 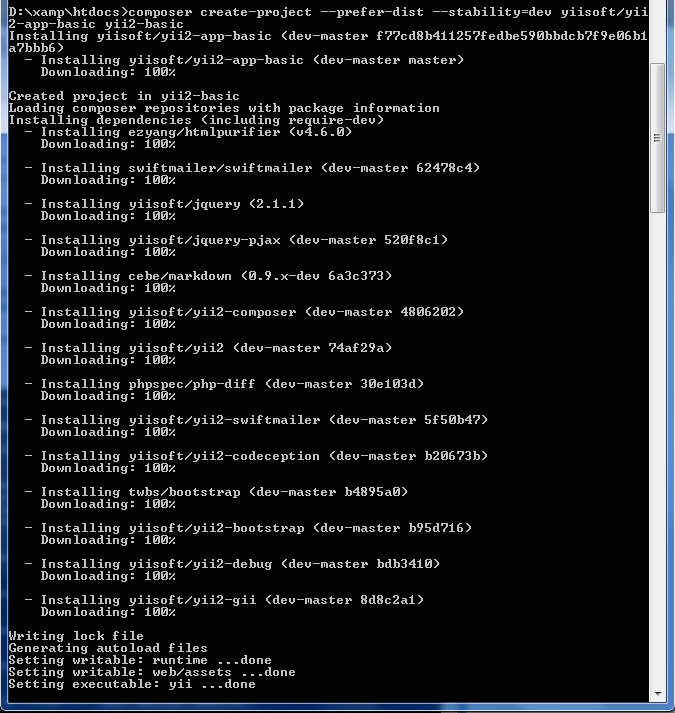 open new command prompt window and run “php -v” command, if everything goes fine it should return something like bellow. Step 2) Open your php.ini file by locating directory ‘D:\xampp\php\’ and search for “pgsql” and Disable the extension by placing a semicolon in the beginning of the line. also enable SSL extension by un-commenting this line. this will help in download composer setup files. Step 3) Finally now by running following command you can download composer to your environment. locate to folder where you want to install composer. like ‘D:\xampp\php\’. This will download and install Composer within less than a minute. This allows you to run the command “composer” anywhere using command prompt. You can use composer with any project directory which is set to use composer by using Command prompt run following commands in that directory. Let say you want to install Yii2 development version with basic application using composer. It will download yii2 development version including its dependencies. see how faster it is. Composer saves time and making your life easier, isn’t it? “First you need Xampp installed…” WRONG! This is all very misleading. I don’t think so, This all is misleading! this error is due to pgsql extension is enabled, you need to disable it before proceed or you must have .NET framework installed. Why you should use composer, if you didn’t installed Xampp or Wamp. @Rana Naeem do not worry your head over “I don’t think so, This all is misleading!”. He contributed nothing but just came to criticize. Thanks for your help with the tutorial. but when trying to use composer in the command line I get an error saying: ‘composer’ is not recognized as an internal or external command…. Never mind, I solved it. I’ll post what I did in case someone else need help. I created a new text file and somehow, even after being saved with the .bat extension, it wasn’t changing the file type. So I created a new tab on sublime text (or your text editor of choice) and save it as composer.bat right since the beginning and it worked. @NaeemRana wonderfully explained. It worked for me too. I’m a WAMP user, installed composer using offline version. 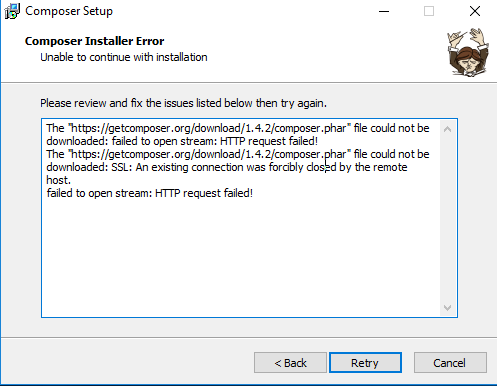 – Then using the offline version of composer.phar I then followed this SO thread (http://stackoverflow.com/a/12059443/1743124) and installed Composer. when i run this line (D:xampphtdocszend> php composer.phar self-update) is show “Access is denied”. Now what can i do.? same problem .. Do you solve your problem ? not a bad article – i found it useful. you should add a reference to xampp in the title, so that google searches show up better. .bat file is specifically a windows scripting file, i don’t think i can be directly run on UNIX. Wine(https://www.winehq.org/) could be used to run Window files on Linux. alternately files with .sh extension are Linux scripting files. Above is not solution to your problem. installation in Linux is far easy than windows. hi – thanks for the reply, i think you mis-understood me. ahh ok. Glad it helps! I am facing the some problem please help. because connection host has failed to respond. extension php_openssl and ‘php_curl` already enabled in php.ini file lacated in C:wampbinphpphp5.5.12. I just downloaded the installer file from same host. You can download file manually. Hi ! Thanks for the article ! I am facing the problem of ambiguous class resolution…. and due to that problem I cannt install other packages like lavacharts and tcpdf…….. please help me.. i am new to understand laravel framework…. Suggesting a few changes to make this process less disastrous for new users. Clearly mention the path variable that is UNDER System Variables. Path variable may also be found under User Variables. Mention the fact about putting the new info at the end of line earlier and do mention the use of semicolon to separate the data from existing one. please help me to fix the error.